Prepare to hear music like you've never heard it before. Silky smooth with musicality and detail. Your digital music will sound as natural as the best analog setups. Until you've heard your favorite songs through the D100 Mk2, you haven't been hearing them at all. 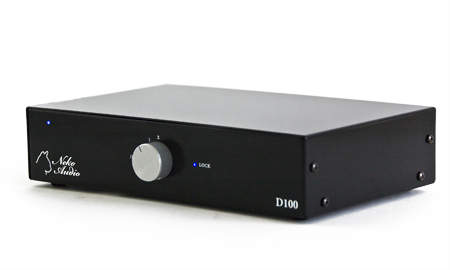 The D100 Mk2 stereo digital to analog converter is a cost-no-object fully balanced dual-mono design utilizing a zero-feedback pure passive analog output stage. All of the advantages of solid state without the dry or harsh sound often associated with traditional designs, and all of the character you love in tubes or non-oversampling designs without the artificial softness or loss of extension. Precision engineered Jensen output transformers provide isolation and gain for noise-free signal transmission. 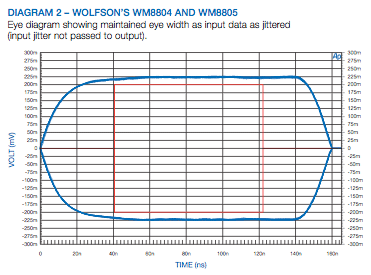 The Wolfson WM8804 buffers and re-clocks the S/PDIF signal for complete jitter immunity. Burr-Brown PCM1794A DAC chips in dual mono mode with separate analog output circuitry for complete channel separation the highest fidelity sound. 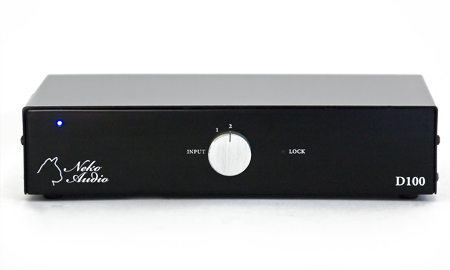 Fully balanced analog audio signal through to the balanced XLR or single-ended RCA outputs. 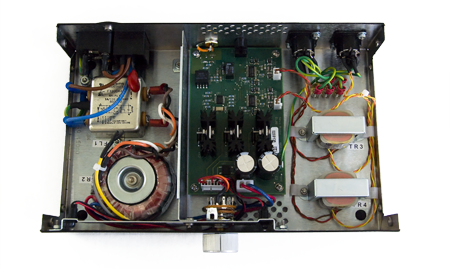 Transformer-isolated coaxial input with noise shunted to chassis ground eliminates unwanted transport or EM noise. Optical TOSLink provides complete electrical separation between transport and DAC. High-quality strict-tolerance tantalum capacitors for long-term reliability and stability ensures the sound quality won't degrade over time. High-quality 0.1% resistors in the analog output stage for accurate sound across the entire frequency spectrum and perfect channel matching. Pi filters on IC power pins maintain stable voltage and current for optimum performance at all times. High-power toroidal transformer provides isolation and noise-rejection for clean power transfer. Commercial-grade two-stage line filter to clean up and reject any AC noise. 2 x 4700uF electrolytic power capacitors for completely stable operation and more than enough power reserve. All solder pads are gold plated to prevent corrosion, ensuring lifetime signal fidelity. A steel chassis provides better low-frequency EM shielding than aluminum, and the internal shield blocks pre-filtered AC noise from polluting the electronics. Star ground wiring to the chassis design ensures complete isolation of ground signals between individual components to ensure noise-free and accurate operation. ...the D100 impressed with its pure and relaxed presentation. ...separation is greater than...any digital components I have auditioned in the past. 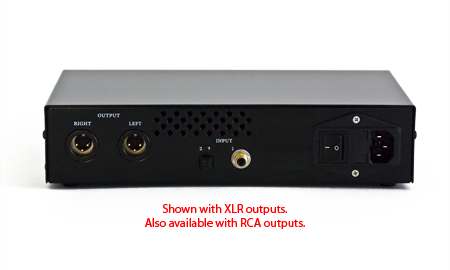 ...the DAC to beat for reasonably priced digital excellence. The Neko Audio D100 Mk2 DAC surprised me with deep taut bass, a smooth midrange, and refined top end. ...musicality that will astound you. ...the most analog sounding DAC that I have ever heard at this price point. As soon as I settled down to listen...WOW. ...the best DAC I've used to date. A clean uncolored sound that is bit-perfect from its source. Midrange and treble tonality was pure with no added harshness, with a smooth (but not smoothed!) response. ...the Neko really stood out as being my favorite DAC among all the thousand dollar DACs I've listened to. The purity of the notes...emerged from a jet black background. In terms of transparency, tonal balance, and retrieval of detail, this is the best DAC I have experienced. "Blackbird" sounded with the D100 as good as I've heard it. ...awesome transparency and detail retrieval. It is the smoothest digital sound I have ever heard! Woodwinds, strings, drums, guitars, flutes, etc all have the correct timbre and tonal balance. Musical, highly detailed, but smooth. The D100 Mk2 just gets out of the way and lets the music flow. Sonically this DAC sails like a home run ball - hit right out of the park! The first thing I noticed was the separation of ALL the instruments in the mix. Vocals are amazing on this unit!! The Neko is clearer in the midrange, seems to have a lower noise floor, and never blurs or distorts in the lower-upper frequencies. The air and dimensionality of Norah are outstanding - something I've only previously experienced with the same song on LP. With the D100 everything was so clear...the piano, the strings, the cello. All the ideas now make perfectly sense, one theme flows into another. Beautiful.